We each grow and develop in our own way and time. 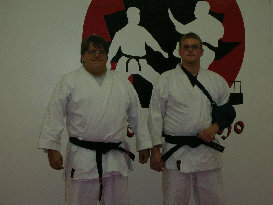 When I first decided to open my dojo, the idea was to give something back to the martial arts. I would teach karate, pass on my love and passion for the art, be a role model for my students, and help my students become more than they thought they could be. Over the years, I have trained many students, promoted 7 people to black belt or beyond, been a referee or judge at tournaments, spoken on the radio, advertised my dojo, and had numerous conversations about karate with people from all walks of life. I think that all of these things were meant to be a gift to karate or the martial arts. However, in reality I believe that they were/are an investment. For each and every thing that I have done to foster karate's growth, I have received much in return. Two examples of this: the mother of one of my students gave me a Christmas card one year, and in it she said "Brandon will be a great man someday because of you." And another student asked me to pin his lieutenant's bar on one side of his uniform when he received his commission in the army. He said they suggested that he have someone who'd made a difference in his life, do that for him. The feelings these acts gave to me were priceless. How can you put a value on things like this? What I can do, is realize that even though I was trying to give something back, I got even more in return. This is the kind of investment that everyone should make. The dojo is really the students, our families, our relationships, and our mutual interest in the martial arts. 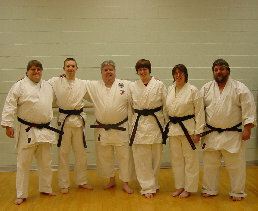 I began the dojo as a way to give something back to the martial arts in return for what has been given to me. 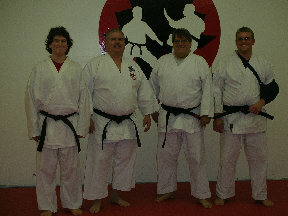 Now the dojo has become a way to make a difference in the lives of others. I invest time, teaching, respect, discipline, and caring. We (the students, the families, and myself) receive personal growth, self respect, self confidence, self worth, a sense of accomplishment, and a feeling of family/community second to none. Any of these items are achievable, all of them are worthwhile, and together we can aspire to success in the whole package. The true success of Jicho'oshin Dojo can only be measured in the way our students live their lives as a result of our teaching and community.